Need to make a payment overseas? Maybe your daughter’s gap year has turned out to be more expensive than she bargained for, or you’re buying a nice little beach-front bungalow in Mexico? Whatever the reason, when you transfer money overseas, you’ll want to be on the look out for the best deal to do so. 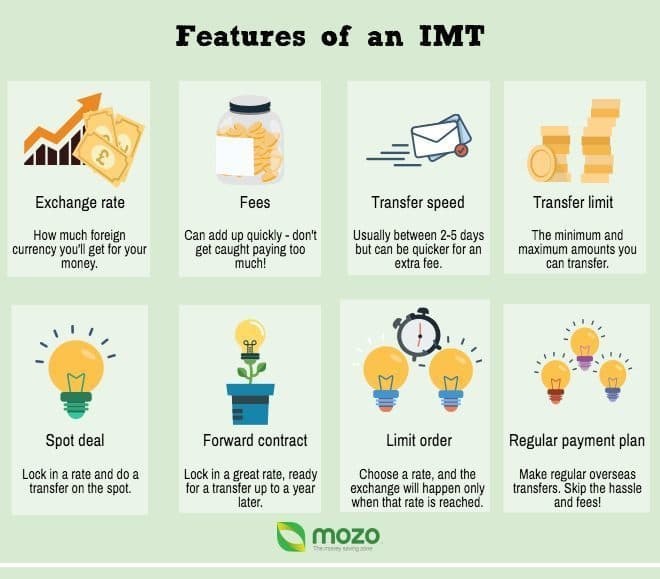 We’ve collected some of the important International Money Transfer (IMT) features that might affect your transfer here to help you get a clear picture of what you’re looking for. The exchange rate determines how much foreign money you’ll wind up with after the transfer is complete. It’s important to compare rates and find the best deal around, especially if you’re transferring large amounts of money. A small difference in the exchange rate could mean a big difference in the final figure! IMTs sometimes come with hidden fees which can quickly add up and seriously decrease the amount of foreign currency you get out of a transfer. Usually there’ll be an exchange fee, and sometimes you’ll pay others, like amendment or cancellation fees. Check out our IMT fees and charges guide for more information. If you’re working to a schedule, how quickly the transfer can be processed may also be important. Usually an IMT will take 1-5 days to be completed - mostly so the provider can verify your identity and do security checks. If you need the funds to go through straight away - in the case of an emergency, for example - it can often be done quicker but the speedy service will incur a fee. This is the minimum and maximum amounts you can send in one transfer, or during a certain period of time (for example, there may be a monthly limit). This might also be different depending on whether you make the transfer online, over the phone or in person, so make sure you check before going ahead. A spot deal is when you arrange a transfer and lock in the current exchange rate on the spot. Exchange rates change all the time, so to keep the one you’ve locked in, your part of the transfer - getting your money to the provider - needs to happen within 24 hrs. A forward contract is a handy IMT feature that will allow you to lock in a good exchange rate for a future transfer. That way, you won’t miss out on a great rate just because you aren’t transferring immediately. Forward contracts usually last between 3 months and a year, and often, you’ll pay an initial deposit up front, and then the rest of the money when you want to make the transfer. Don’t have time to watch for the best exchange rate to pop up? That’s where a limit order comes in. You can nominate an exchange rate you’d like for your transfer, then your provider can monitor rates for you and perform the transfer only if that chosen rate is reached. Just remember - once the transfer is triggered, it’s legally binding and you won’t be able to change your mind. Have regular international costs you need to pay? Maybe you send regular payments to family living overseas? You can set up regular IMTs for bi-weekly, monthly or quarterly payments to make things easier. Plus, setting up regular payments with one provider often means they'll waive the transfer fees, and sometimes, you’ll even have the option to lock in a fixed rate for all your payments. Better exchange value. When you opt to use a specialist IMT provider and snag yourself one of the great exchange rates they offer, you’ll generally wind up with more money on the other side of your transfer, than if you had sent the money via a standard bank account transfer. More flexible features. An international money transfer gives you a range of options, including spot deals, forward contracts, limit orders and regular payment plans that you wouldn’t be able to use if you decide to use alternative international payment methods, like credit cards or Paypal. Higher transfer limits. Your bank may have a daily withdrawal cap which applies to how much you can transfer overseas each day, and while some IMT specialists also have upper limits on how much you can send, generally speaking, they’re higher. This is good if you’re trying to make large, lump sum payments, like a deposit on an overseas investment property. Easy access. Most dedicated IMT services allow you to perform transfers online or over the phone, which means you’ll have easy, 24-hr access. Don’t let your hard earned dollars get lost in translation! Here are some tips on how to get the most out of your international money transfer. 1. Keep your receipt and note the time limit on refunds. If your recipient doesn’t claim the money you’ve sent, you’ll need to reclaim it. 2. Plan ahead. With handy features like forward contracts and limit orders available, planning your IMT ahead of time when possible can ensure you get a great exchange rate. 3. Shop around. Different providers offer different benefits, so shop around and find a deal that works for you. For example, opting for an IMT specialist over your regular bank can mean avoiding an exchange fee. 4. Consider your transaction amount. Some providers will waive fees on transactions over a certain amount, so if you were planning to send a few small payments, think about consolidating them into a large one to meet this threshold. Once you’ve learnt all the features to look out for when choosing an IMT offer, the next step is comparing all the different deals on the market. Head over to our international money transfer comparison page to find the best option for your money.